4Easysoft iPhone Manager brings three main functions to you: transfer iPhone to PC, transfer PC to iPhone, and transfer between two iPhone. That's to say, with 4Easysoft iPhone Manager, it takes it easy to backup iPhone files to Computer, export files/folder from Computer to iPhone, and manage video/audio between two iPhone for sharing with your friends or other purpose. 4Easysoft iPhone Manager takes more editing features. It can display your iPhone info automatically, like the iPhone type, capacity, version, etc, create new playlist and edit playlist. In order to find your file quickly, this iPhone Manager can allows you to browse your video/audio easily (Genre, Album, Artist), etc. 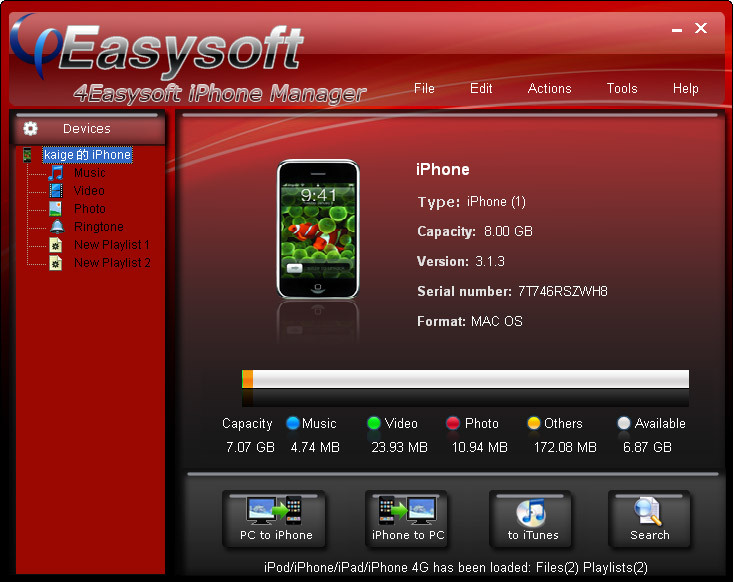 Moreover, 4Easysoft iPhone Manager is available for iPhone OS 3.0, iPod Firmware 3.0. Key Features 1. Full-featured iPhone file Manager to transfer between iPhone and Computer Transfer iPhone to PC Ability to copy iPhone files to PC for the backup of your iPod for any purpose. Transfer PC to iPhone Access to import files/folder from Computer to iPhone without the help of your iTunes. 2. Full manage over your iPhone Recognize your iPod/iPhone Once you connect your iPod/iPhone, 4Easysoft iPhone Manager can recognize your iPod/iPhone specific information, such as iPod type, iPod capacity, iPod version, serial number, format, and the available space , used space in your iPod. Quickly browse your iPod/iPhone library Check "Search" to browse your iPod/iPhone library, including the Genre, Artist, Album info. 3. Manage iPhone/iPod faster and easier Easy to use Two click to finish your manage on iPhone, iPhone to PC, PC to iPhone, and it designed for beginners, easy enough for everyone. Fast rip speed Provide the fastest rip speed to export iPhone files to Computer, Computer to iPhone, and between two iPhone. Friendly user interface An intuitively designed user interface brings you more convenience and enjoyment.